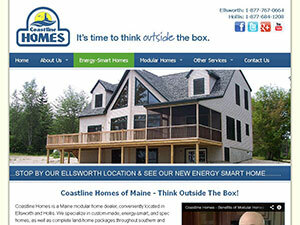 Coastline Homes is a Maine modular home and manufactured home dealer, conveniently located in Ellsworth and Houlton. We have many options to choose from including single wide, double wide, and mobile homes. We specialize in custom made, energy smart, spec homes and all varieties of manufactured housing as well as complete land home packages throughout Maine. Building a new home can be exciting – and also overwhelming. No matter what you're looking for, our team of knowledgeable professionals will guide you through the building process from start to finish. From customized design to sitework, from location to financing, we'll work with you to ensure that you get the home you want without a hassle. Coastline Homes has proudly served all of Maine since 1993, providing homes custom-built with the highest-quality materials by skilled Maine craftsmen. Our modular and manufactured homes are custom built to your specifications by Commodore Homes, Kent Homes, Pleasant Valley, and Premier Builders. Our experienced builders and top-notch subcontractors work together to deliver precision in every detail, using the best name-brand materials. We guarantee a beautiful, durable home you'll love - with quality you can trust. Want to learn more about our high-quality, affordable homes? Set up an appointment with our professional builders!